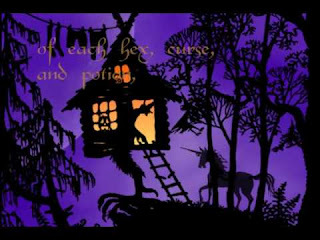 Beautiful video featuring the music of Nox Arcana based on the silhouette art of Jan Pienkowski. It's a few years old, but it always gives me chills and is perfect for setting the Halloween mood! As a fellow vegan who's favorite season is also Halloween, I just had to say I love your blog. Just found it today and I'm looking forward to your upcoming posts for Halloween. How do I subscribe to your blog? I added to my favorite places, but can't find the link to subscribe. Welcome, Greg, and thanks for finding me! You can subscribe by going to the right-hand side column, finding the section that says "Haunting the Place" and clicking the blue button that says "Join this site". You will need to log into your blogger/Google or Twitter account for this. You can also do the same thing at the very top of the page where it says "Follow". Links are also provided on the right-hand side column to the Spooky Vegan on Facebook if you prefer to follow there.